CT of the chest revealed diffuse ground glass opacities with a more focal consolidation in the left upper lobe and lung bases (Figure1). Given the concern for PCP, patient underwent bronchoscopy and broncho-alveolar lavage (BAL) which revealed numerous Pneumocystiscarinii organisms on gram stain. As the patient continued to have significant hypoxia and dyspnea, a follow up chest CT two weeks after the initial CT was performed that revealed extensive cavitation versus bullous disease with upper lobe predominance and coarsening of the pulmonary interstitium (Figure 2). 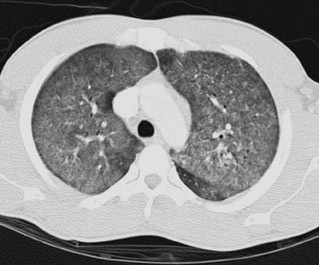 One week later, another CT showed further progression of the coarse, cystic interstitial changes within the lung (Figure 3). A follow up CT of the chest four weeks later, showed progression of changes associated with PCP and thickening of the largest cyst wall in the left upper lobe. 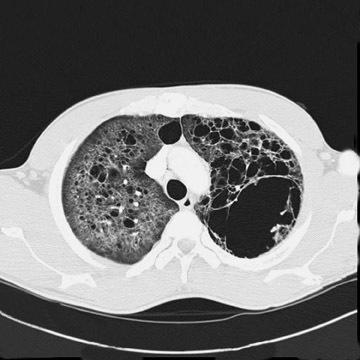 The patient also developed pneumomediastinum and CT of the chest showed increase in the cavitary disease (Figure 4). After decades of debate, Pneumoncystis carinii pneumonia (PCP) has recently been reclassified as a fungal infection and renamed Pneumocystis jirovecii pneumonia. PCP has been a common opportunistic infection in imunocompromised persons especially persons infected with the human immunodeficiency virus, those with lymphoproliferative disorders, and transplant recipients. Radiologists are often the first to suggest the diagnosis of PCP and consequently HIV co-infection. 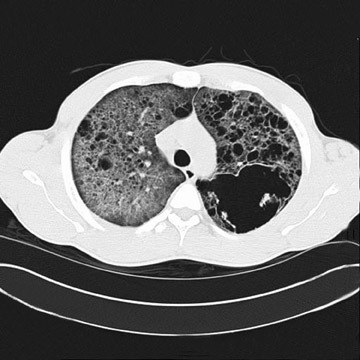 The classic presentation of PCP is bilateral perihilarinterstitial disease that becomes progressively diffuse and causing extensive cavitations and lung destruction.1 Three CT patterns of PCP have been characterized and include a ground-glass pattern, a patchwork pattern, and an interstitial pattern.2 Cystic lung disease, spontaneous pneumothorax, and upper lobe parenchymal opacities have been reported in the literature.3 In past cases of severe PCP, histopathology has demonstrated organisms within the pulmonary interstitium, which progress to tissue necrosis, likely ischemic, and eventual cavitation.4,5,6 However, rapidly progressive fibrocystic disease in the setting of adequate treatment as in this case has not been well described. Drug prophylaxis is currently recommended for all HIV-infected patients with a cd4 cell count less than 200 circulating cells per mm.3,7 Although this patient’s first cd4 count was above 200, it is unclear if his baseline cd4 count was slightly lower, possibly predisposing him to PCP. 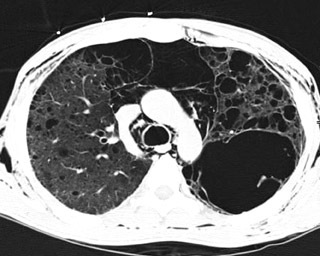 A definitive diagnosis requires demonstration of P. jiroveci cysts in respiratory secretions. This patient’s diagnosis was confirmed by cysts visualized in BAL. Although appropriate antibiotic treatment was initiated immediately the patient continued to develop progressive lung destruction. The most dramatic parenchymal changes occurred in the 3 weeks between scans while the patient was receiving adequate intravenous antimicrobials as well as high-dose corticosteroids. Other opportunistic infections such as mycobacteria, fungus,and other viruses had been excluded. Rapidly progressive cavitary lung disease can occur in the setting of PCP even on appropriate antibiotic therapy. Although drug prophylaxis for PCP is widely used, HIV-infected patients still present with severe complications from PCP including extensive lung destruction. It can be clinically helpful to re-scan patients who are not improving on standard-of-care antibiotic regimens in order to assess progression and prognosis. DeLorenzo LJ, Huang CT, Maguire GP, Stone DJ. Roentgenographic patterns of Pneumocystis carinii pneumonia in 104 patients with AIDS. Chest. 1987;91:323-327. Kuhlman J, Kavuru M, Fishman EK, Siegelman SS. Pneumocystis carinii pneumonia: Spectrum of parenchymal CT findings. Radiology. 1999;175: 711-714. Crans CA Jr, Boiselle PM. Imaging features of Pneumocystis carinii pneumonia. Crit Rev Diagn Imaging. 1999;40(4):251-284. Murray CE, Schmidt RA. Tissue invasion by Pneumocystis carinii: A possible cause of cavitary pneumonia and pneumothorax. Hum Pathol. 1992; 23:1380-1387. Watts JC, Chandler FW. Evolving concepts of infection by Pneumocystis carinii. Pathol Annu. 1991;26(1):93-138. Klein JS, Warnock M, Webb WR, Gamsu G. Cavitating and noncavitating granulomas in AIDS patients with Pneumocystis pneumonitis. AJR Am J Roentgenol. 1989;152:753-754. Thomas CF Jr., Limper AH. Pneumocystis pneumonia. N Eng J Med. 2004;350(24):2487-2498. Fulminant pneumonia with cavitary destruction of lung parenchyma. Appl Radiol.